Over at sugarfreegamer.com, I've started a Boardgame AAR on a playthrough of Victory Point Games Zulus on the Ramparts. "NS Ordensburg Vogelsang - a field trip"
This game is "Gundam's game". Scinario is "Sneaking of woman spy" from "Tactics #1". What is the most $ you have ever payed for a game? We will have a mini-Con in Paynesville, MN on 8-9 Oct 2011 [weekend prior to Columbus Day], 'PayneCon I'. It will be a viral mini-con; invite only, allowed to bring one friend. If you want an invite, please email me. Cost = $0 US. Yes, free. Currently looking for event organizers/sponsors. VPG's Napoleonic 20 going to GMT! In a move I think that no one could have NOT predicted, one of VPG's flagship series is getting the GMT Deluxe Treatment(tm). Last night, during the pre-game show for the NCAA basketball championship, ESPN2 carried this feature on La Roche College's basketball program, and Coach Scott Lang. I find this well worth watching, and not just because I'm on the La Roche faculty. Operation Red Nose....games, games...and more games! I have decided to have a spring clean and clear out some of the unwanted wargames and unmade model kits that I have. If anyone feels they may be interested in the items before they go on ebay, please send me a message and I will return a list of the unwanted back to you. This is AAR of "The Chickamauga Campaign". 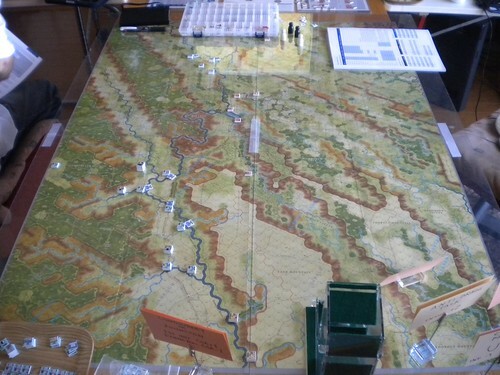 It is one of advanced game scenario of Battle Above the Clouds. My friend "taku" as the Union, I am the Confederate. In this episode, Jason goes through some feedback, opens the package from Your Move Games, and focuses on a smaller publisher for his pre-order spotlight. He also has some wargaming news, good and bad, and goes through some feedback. Add to this the standard games played, poll results and other fun at the end of the episode, and you get the best two hours in wargaming. Other than gaming itself, of course. No Point 2 Point in March??? Oh NO! Okay, it's not that bad. I have recorded everything, I just haven't had a chance to finish the editing. So, it will be out by the end of the weekend (April 3 at the latest).